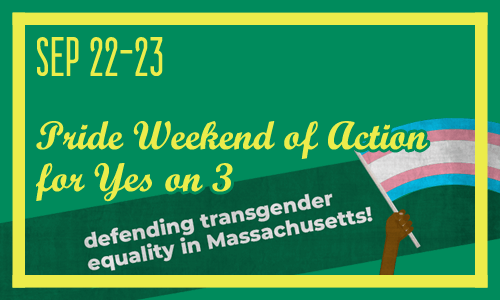 Help protect the rights of transgender people in Massachusetts and sign up to join Freedom For All Massachusetts in Quincy on September 22 and 23 for the Yes on 3 Weekend of Action! We need to talk to thousands of voters about why non-discrimination protections for our transgender friends and neighbors are important and must be defended. That’s why Boston Pride is determined to have 40+ volunteers join forces with Freedom For All Massachusetts to speak directly with voters! All are welcome and everyone is needed. We will be meeting with Freedom For All’s field team to canvas in Quincy, on Saturday, September 22, and on Sunday, September 23, at 10am at Christ Church Episcopal (12 Quincy Ave, Quincy, MA 02169). Please click here to register to volunteer, and mention that you heard about the action from the Boston Pride website!